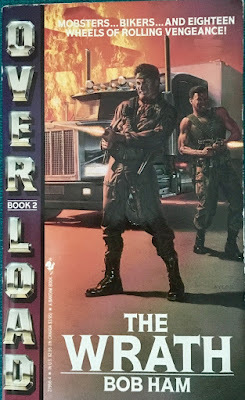 Bob Ham's Overload series debuted in 1989 with "Personal War". His follow-up is a few weeks later with entry two, "The Wrath". It's once again released by Bantam Books, complete with that lovable Red Rooster logo. 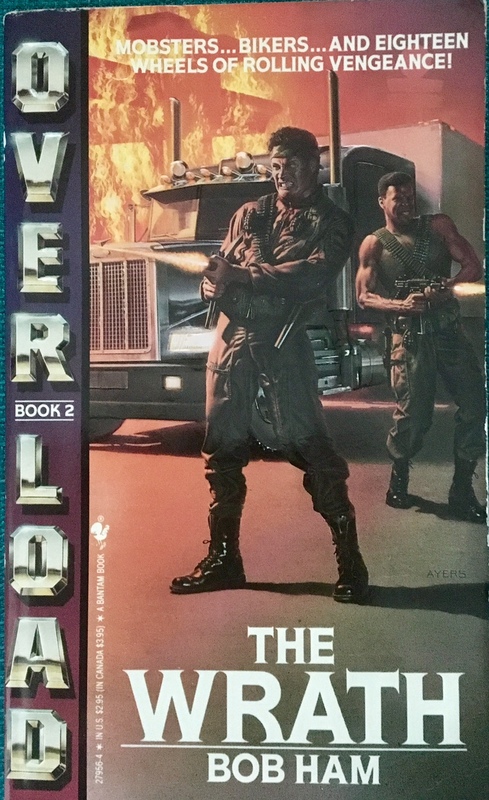 The first novel introduced readers to Marc Lee and Carl Browne, Delta Force standouts that went to war with the Mob. Do we need even need a reason? Yeah...the Mob was putting the squeeze on Marc's father and his Texas freight company Leeco. All of this is recapped on the first page of "The Wrath", including the end result - nobody messes with Daddy. The fallout from Lee and Browne's first war is the ultimate premise of the sequel as both are forced into action against a psycho motorcycle gang (or club) called Lobos. The bikers were "cocaine cowboys" in the pipeline of trafficking and distributing that Lee and Browne shut down. The remains of this Mob family requests the bikers handle vengeance their own way. This leads to a crazy Vietnam vet named Bruno leading the bikers into war against the police, feds and our obligatory heroes Lee and Browne. There is some undercover FBI nonsense thrown in to add a little intrigue. Also, in shocking fashion, the US President makes an appearance requesting our paperback warriors report to some third-world country to stop terrorism. Yeah, our dynamic dudes are just that damn good. This all sounds promising, right? Delta Force warriors versus crazed motorcycle ruffians. But the whole thing craps the mattress thanks to horrible writing, a botched pace and one of the most ridiculous villains in pulp fiction. The author defies any logic by placing the bikers all over the interstate running and gunning through traffic with complete freedom. Where are the freakin' cops? Literally worse than Gotham's police force. The villains just run around on the loose and nothing really prohibits them from controlling American highways. This is just lazy writing, but ultimately leads to the Overload duo's barrel-chested bravado. Only they can stop the bikers since the law can't, right? And they do this, but only after the reader has thrown the book from wall to wall in utter disbelief and frustration. There are more books to the series and I had a handful in my hand the other day. I quickly put them back on the shelf, discarded and abandoned...the only response Bob Ham is getting from me. Ugh.